I needed to make a birthday card for the upcoming weekend, and today's sketch worked for me. It's not a new layout to me, but hey, it got things rolling this morning. I stamped the gel-a-tins Wild Things set with craft inks, then outlined them with markers and swirled the colours together with an aquapainter. 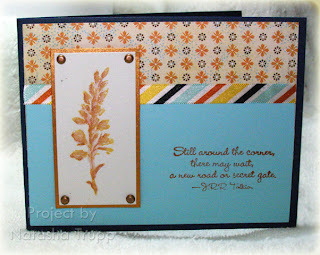 The main image panel was spritzed with some of my home-made shimmer spray, to match the shimmery designer paper. 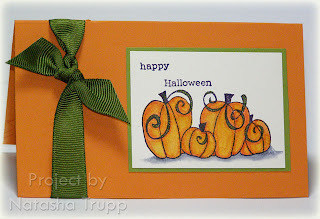 The colours were inspired by the American Crafts ribbon on there and the shimmery paper by SEI. 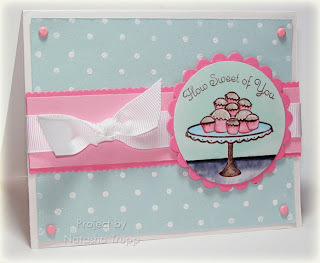 I received this darling set, Sweet Treats by Flourishes, today. It has all sorts of cute treats and bonbons in it. I used the smallest part of the 3-tier tray to make a single tier. I did a lot of masking and filled it up with small bonbons. Once I had that all stamped, I coloured them in with various types of markers (copics, SU!, etc). The bonbon tops are filled in with white liquid pearls. For the background, I had simply wanted white polka dots. However, white craft ink really doesn't show that well on soft sky, so I quickly decided to emboss the white. Accessories, etc. : 5/8'' white grosgrain, pretty in pink brads, pop dots, circle nestabilities, mini scallop scissors. First, I figured I'd post my card for those that don't care to read about any personal mumbo-jumbo. This was one I made back in September. It was for a Dirty Dozen sketch challenge, but I didn't think it was worthy. I started this one first with some Mellow paper. I looked at it and tried to pull out the closest SU! colours. 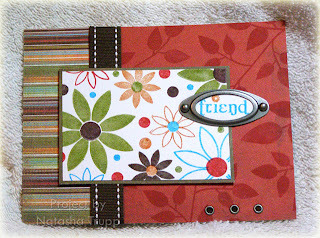 I stamped a bunch of the flowers on the white, and leaves on the red. It's pretty basic (which was why I never uploaded it before). So, I was tagged today, but it was a tag I hadn't seen yet, so I figured I'd give it a go. Kim from Clearly Inspired tagged me. What we do is list out 10, 20 and 30 years ago and what we were doing at that time. I find this terribly amusing. 20 years ago. Hmm, it was 1987, I was 3. I imagine I was busy drawing with smelly, fruity markers, and getting ready to be a witch or a fairy princess for Halloween. 30 years ago. I wasn't even a twinkle in my parents' eyes. It was 1977, my parents were about to get married- Dec.23. That was a relatively painless tagging. I'm heading out of town this weekend, so I'll likely not have an update until Monday. 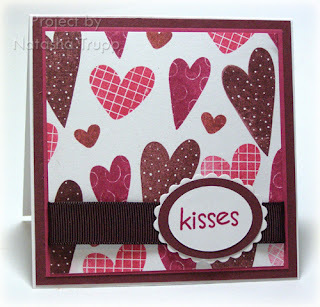 I really love using this heart themed set, Hugs & Kisses, by gel-a-tins. This card actually started out as an experiment. I LOVE all the shimmery paper out there, but refuse to splurge. As you may know, I have made my own in the past. However, I usually spritz my shimmer concoction after all the stamping is done. 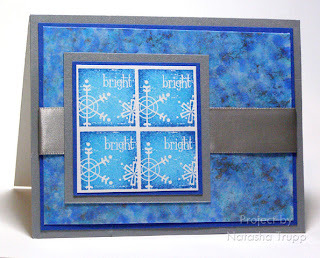 This time, I wanted to see if the shimmer still shimmed through solid stamping. Well, guess what, it does. I really didn't expect this to work out. I figured my hairspray+pearl ex would repel dye ink, but no! Here's a close-up shot(be sure to click it for the larger version), you can see the shimmer a bit in this one. Anyway, so this card all started by spraying some of my shimmer mist on white. I let that dry, then just started grabbing the jewel tones of red and pink and got stamping. I just kept stamping until my little square was full. I added a few layers, some 5/8'' burgundy grosgrain and a lovely nestabilified sentiment (3 dies were used to make that). You know, I do like making more complex cards, but sometimes, I just like how the simpler ones turn out. I'm all for stretching beyond the 'box', but why mess with something that works? I decided to do today's sketch challenge. Well, it wasn't so much a decision as a happening. 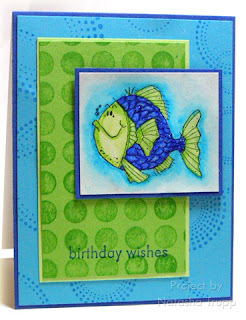 I sat down to make a card using this fish I had coloured in last week. I pulled my colours from the image, and then realized that today's sketch just might work. I brought out some background stamps. What is it about ocean-themed stamps that have us bringing out the circle backgrounds? I'm really happy with how it turned though. The watercolouring/colouring ended up nice and vibrant (the stickles help keep it looking shiny and sparkly), plus the card actually has a purpose-always a good thing. I decided to finally get creative today, this evening. I had glanced at the colour challenge earlier, and as long as my memory served me correctly, the colours were pomegranate, basic grey, and sky. I thought about these in my mind, and they seemed pretty together, so I figured I'd give it a whirl. I looked through my little book of inspiration, found a sketch that I had been meaning to try, didn't stick with the sketch after all that, and this is what I ended up with. It's quite simple, but I really like it. I didn't have any Soft Sky ink (well, I've got the reinker, but that's it) so I went with versamark for my tone-on-tone stamping, something I haven't done in a long time. I stamped the grey sentiment first, then filled in the rest. Here are a few more cards featuring the new gel-a-tins release. For the first card, I wanted to mimic the look of the collaged image in SU! 's Season of Joy. I started with a 2.5'' square block, and started filling it with various images from Oh Christmas Tree. It worked quite well. I inked it all up with stampin' spots- burgundy, artichoke, and hunter. I wanted some scallops, so I got out my mini scalloping scissors and cut a nice mat from some burgundy paper. For this other card, I know you've seen this layout before. I just can't get enough of it, and it always remains classically elegant. I inked up the bright image with 3 spots- first bashful blue, then ballet blue, and just a touch of brilliant blue on the edges. After I stamped the 4 images, I heat set them, then embossed a square around each image. I was going to leave it, but that white organdy was calling to me. 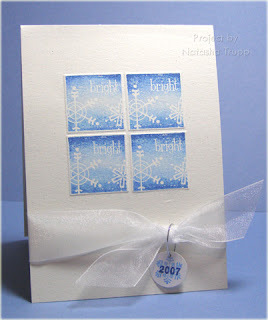 Then, to add a little personal touch, I stamped a snowflake on white with the year over top, then punched that out with a 3/4'' circle punch. I tied that on the know with silver cord. It's kind of a nice touch, to add the year to your annual Christmas card. Accessories, etc. : white organdy, simple shapes embossing template, stylus, silver cord, 3/4'' and 1/16'' circle punches. When I was at Michaels this past week, I kept passing by these delightful cake stickers by Martha Stewart Crafts. The price here- 6.99! Not like I'd buy a sticker without trying to recreate it first, but still. This meant that I had a challenge for myself- to make a tiered cake. I thought about doing it all free-hand. Instead, I started with some oval dies. I cut out 3 ovals in confetti white paper. To make them cake-like, I snipped off a 1/4'' from each side. Next, I took a bigger oval, and used it to trace a curved shadow at the top of each layer. I also outlined each layer with the grey marker while I was at it. I attached the 3 tiers, then punched out some flowers from this year's punch kit. I sponged them to make them a little darker than the cool caribbean scalloped plate I had set the cake on. Then, I attached some gelly gems in the centers. The card base was made using a regular card base and the largest circle nestability. When doing that, be sure to not completely have the die cut on the paper, you need to have some over the fold so that you don't just end up with 2 circles. The scalloped layer is the largest scalloped circle nestability, so if you were to turn the card over, you'd see that this layer is larger than the actual card. So today was a fun day! I started off the morning with a stamp-meeting at my upline's house. Next up was the SCS meet and greet. It was lots of fun, we laughed a lot, swapped, and then went on a "field trip" to the Michaels across the street. There are a few photos already posted (including an not-so-flattering one of me, I know you all are itching to see that one, lol) here. We're hoping to get a semi-regular thing going, and more would always be welcome, so keep your eye on the Get It Together part of SCS. I was also in the mood for some stamping. At the meet, Christine and Tami were kind enough to bring a bunch of their marvy punches. So after seeing all those scallops, I had to do something with scallops. 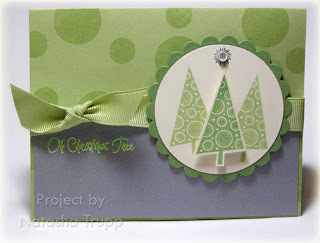 I stamped two trees from Oh Christmas Tree in celery, then another one in wasabi. I cut that one out and popped it up. The background was done with circles from You Spin Me Round. 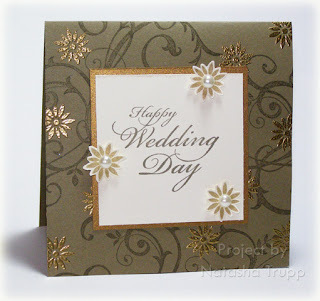 The greeting was embossed with Get In Lime embossing powder. I was at Michaels today, and my sister found this adorable pumpkin stamp. How cute is it! I came home and started to colour it in right away, using a blend of all sorts of markers. Like I've said in the past, I seem to have this problem- when I do detailed colouring, I just don't want to bother with an excessively detailed card. I browsed around my desk, looking for some Pumpkin Pie coloured scraps, and I found the beginnings of a tag card, it measured 9x5, scored every 3 inches. I cut off one panel, leaving a 6x5 card. It was just the perfect size for this image. I finished it off with a little bit of grosgrain, and everyday flexible phrases, and that was that. So if you're looking for a different sort of challenge this weekend, I encourage you to try this 3x5 size. Here are a few cards I made this evening. The first came together very quickly. I started with a colour scheme of rose red, moss green, and so saffron. I stamped the leaves on some natural white paper. Then I stamped several flowers on the same paper and cut them out, mounting them on dimensionals. This layout was a sketch challenge a few weeks ago. I may have modified it a little bit, I'm not sure if I sketched it down exactly. That's where I got the tab idea anyway. There are some stickles in the flower centers. This second card took WAY TOO long. I don't even love it, but I put so much time into that I don't want to give it away now. See, this is how it all started... 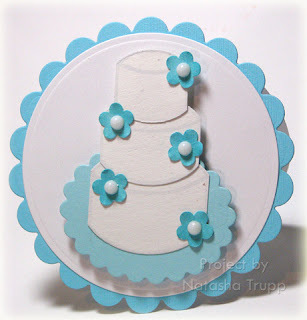 I started with Bodacious Bouquet, stamping the swirls and smaller flowers. That turned out decently, but then I stamped with teal craft ink and it got smeared. So, then I started over. This time, I used the Bodacious wheel instead. I coloured it in with celery, apricot, teal, and guava (a blender pen with guava reinkers) markers. Well, despite all my huffing and puffing, and my sister making fun of me as I attempted to reactivate the ink, it barely showed up. It gave me a basic guideline, so I coloured them all in with markers- good times... Now, when it came time to do the greeting, I simply embossed it this time, no smearing! The rest was straight-forward, and mostly quick from this point on- tying a knot, piercing, and dry embossing. That's right, after a few weeks of not using this paper, it resurfaced today, for the sketch challenge. This week's sketch was a basic design, but sometimes those are the most inspiring! I started with the leaves stamp. I stamped it, then drew a rectangle over top with pencil to determine where I was going to cut around it, for an out-of-the-box look. I layered that on wasabi, then again on a word embossed cocoa piece, and finally wasabi once more. 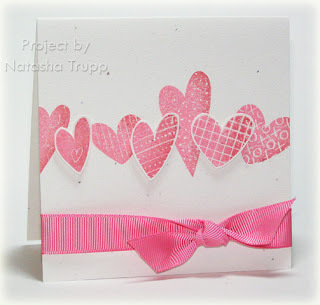 The rest of the card is fairly basic- design paper, one more layer, and more background stamping. I haven't made a clear card in a while, and I was feeling a little withdrawal. I started with a 4.25'' square card base, made from acetate. 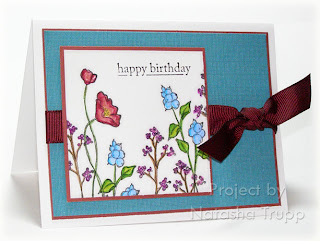 I stamped that with the line art flower from Boho Blossoms. 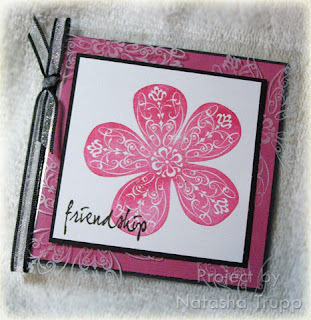 Then I stamped my main panel with colorbox magenta ink for the flower, and versafine black for the greeting. I used black to add a bit of 'pop' to the design. Thank you everyone for your kind words! I really appreciate it It so nice to have your support. I recently received the It's a Jungle Out There set by My Favorite Things. This is a very cute set. I love the animals. I felt like doing a bit of colouring, so I started out with that, stamping the images with Timber Brown Stazon onto Natural White cardstock. I coloured them in with SU! markers and an aquapainter. So there I had 2 cute images and sentiments, now all I needed was a layout. My inspiration came from here. I didn't use dimensionals for the one layer, and I went with thicker ribbon. My backgrounds were stamped with the leaves from the jungle set. Click on the photos if you want the close-up view. Judging by the overwhelming response to Julie's tutorial, I'm guessing a lot of the community hadn't yet tried enhancing marker coloured images with the aquapainter. I just thought I'd throw out a few tips, since this is how I've been using the markers since I got them. 1) Watercolour paper is not the only type of paper this works with. 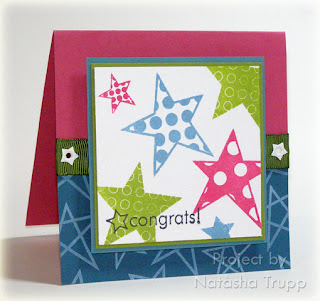 The Stampin' Up markers are streakless on kraft, natural white or ivory, and confetti white or cream. I find that using watercolour paper, well, it makes my project look watercoloured. These other papers I've listed don't have that effect on the appearance, plus they are less expensive! 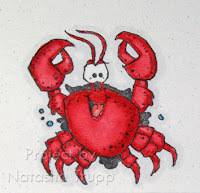 The crab below was stamped with black stazon on natural white paper. 2) Instead of outline colouring your main image and pulling the colour away with an aquapainter, try squiggling a bit of colour onto a piece of plastic. Blend that into the image if you want a more gradual lightening of colour. 3) Consider getting a light grey alcohol-based marker if you like the subtle outline shadowed look. You can find a 10% grey marker from Prismacolor for pretty cheap. It adds such a nice shadow to items. I don't know how much I'll feel like updating for the next few days. My family and I had to say goodbye to a good friend and family member yesterday. 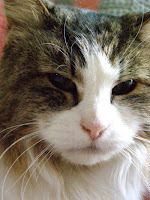 Gizmo was 16.5 years old and was a lovely addition to our family. She will be dearly missed. I needed to make a baby card today. There were a few guidelines I was given: it needed to have blue and yellow, it was for a boy, the parents are football fans, and the gift is somewhat sport themed as well. I knew I wanted to use the All*Star image from Sporting, but I needed to make it more for a baby. My last resource was going to be snap stamps, but first I looked through all my clear sets. I came upon this one from a Studio G set, it says Welcome Little One. Well, that was easy enough to alter, I just didn't ink up the "one". Yay, the perfect message: Welcome Little All*Star. The rest of the card is pretty basic, even though it took a while. 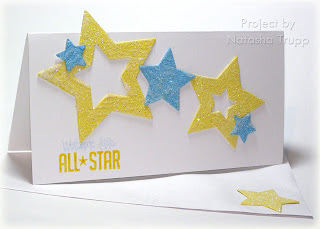 First I had to die-cut out the stars (these are nestabilities) from thinner chipboard. Next I painted them with a few coats of yellow or light blue acrylic paint. Next, once dry, I covered them with mod podge and glitter. Again, let them dry, and finally I could attach them to the card base with ultra sticky tape. Due to a miscalculation, I had the wrong size of a yellow star leftover, so that went on the envelope. Well, with this near icy weather, it only seems fitting to post some more holiday cards! This first card features something I like to do every now and then, especially around the holidays: Stamp a short holiday word with some other holiday images. 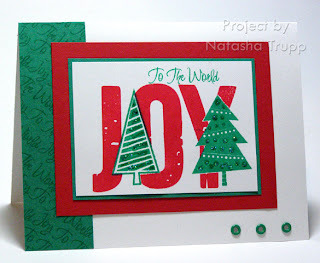 In this case, I stamped the 2 trees first (from Oh Christmas Tree), masked them, then stamped the word JOY using letters from the Weathered Crate alphabet. I added some stickles to the trees, then went with one of my go-to layouts. 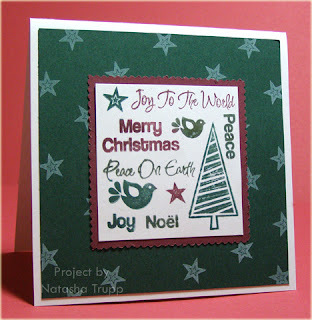 This next card started out with the me struggling to choose a colour to use on this stamp from Holiday Mail. Finally, I opened up my craft spots, the turquoise jumped out. Well, I've always leaned towards bright blues, so I thought, why not. I inked up the stamp with the turquoise then gently dabbed the brilliant blue spot all around it, which blended the colours nicely. Next, I thought, it'd be nice to bring in some silver to make it a bit more elegant. I found this beautiful silver satin ribbon, my brushed silver cardstock, and to pull it all together, I made some polished stone background using turquoise, brilliant blue, and silver reinkers. I always love how polished stone turns out. It's even more impressive when you bounce the light off of it, it really looks like a polished stone! This project was started at first to be something really detailed, but I just couldn't add anything more to it. 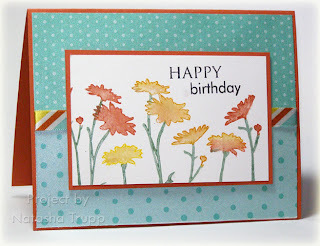 I stamped the petal prints with a combination of mustard and sun craft ink on confetti white. I drew in some lines with a copper gel pen, then used an aquapainter to blend it into the ink. I've always loved this quote, and for some reason, it just seemed to fit with this card. 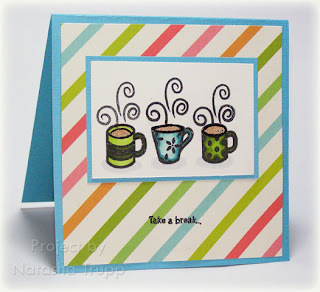 I have been wanting this set, Coffee Break, by gel-a-tins forever. I am not a coffee drinker, although I do like the scent of it. Anyway, this set is too adorable. 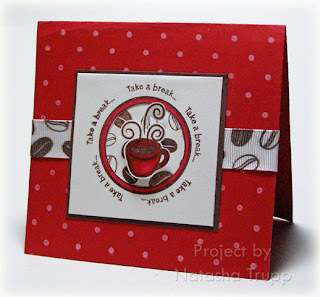 Plus with coffee-scented embossing powders, it sure makes for fun cards. While watching SNL last night, I coloured these little mugs with various markers. After they were dry, I coloured in where the liquid would be with a versamarker and sprinkled with the extra foam vanilla latte EP . I love how it now not only smells like coffee, but it looks like a frothy concoction as well. I wasn't feeling like anything too complicated, so I found a piece of Scenic Route DP (this is actually the reverse side seen on the Thanks a Million Card . I was happy to see that the colours I had chosen went magnificently with this paper. So yesterday was a "good mail day" as they say. I received some new gel-a-tins! I LOVE these designs. They are so much fun to play with! Check them out here if you're interested. They also have some new embossing powders. The peppermint one is AMAZING!!! The first card features Oh Christmas Tree. I love all of the other holiday designs, but I was really wishing for a tree one. This one was exactly what I was hoping for. 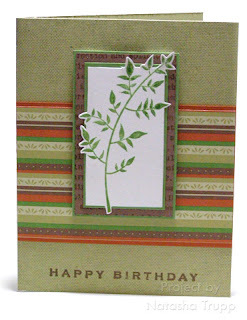 It has 6 funky patterned trees and loads of sentiments and accessories. 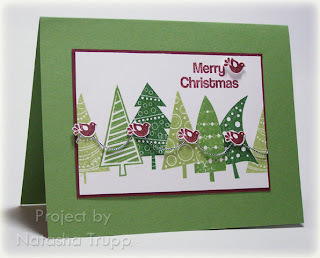 I stamped and masked several trees here using Celery, Wasabi, and Garden Green. It was cute like that, but those darling birds were calling to me. I thought it'd be cute if they were decorating the trees with a strand of silver. This was one of those ideas that I was unsure of execution. But, with careful planning, it worked. Each silver swoop is a separate piece of silver cord. It taped on either end, under the birds. The birds were then attached to add more strength to the cord sticking. 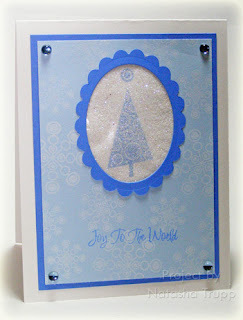 Next up is a card featuring the set Holiday Mail. It's got a very cool worn, vintage look, something I really haven't seen much of in clear stamps. If you like the worn look of this set, I'd also recommend Spiral Symphony and Weathered Crate Alphabet. For my first creation with this set, I wanted to make full use of the build a stamp elements. I started with the outline stamp, again using masking to get some overlap. Then I filled in the outlines with 2 of the 4 cute square images. I added the price to the stamps (the set includes 1,2,3,4,5,6,7,8,9,0,0 for all your numerical needs). The chocolate frame was done using the small double hole punch. I punched into the paper about half way, always using the guide of the one hole to line up the next punch. Once again, my card was at the point of cute, but I wanted to keep going. 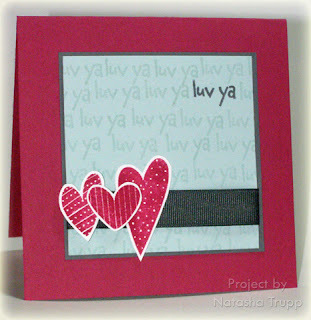 I wasn't sure how the mail markings would look on top, so I cut a piece of transparency oversize and stamped on that. I really like how it turned out. I was going to just use that, but I didn't want to deal with the attachment issue. I hadn't intended on bringing brads into the design, and I don't have any adhesive spray. 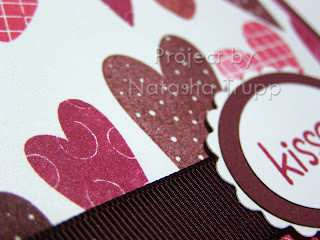 So, instead, I stamped the mail markings it chocolate craft ink and embossed them with clear powder. It worked wonderfully! Plus it adds a "reach out and touch me" quality to the card. Now the scary thing with this was, I went and lined up my overlay afterwards, to see how close I had gotten to my test run placement. All elements matched up EXACTLY!! How unlikely! Well, technically, this card is anything but thymeless, but I was looking for a catchy title. I needed to design a wedding card for my sister's friend. 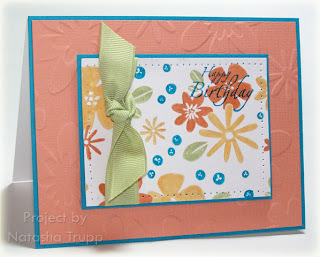 I wanted to do something classic and elegant, so I started off with a square card from the Thyme paper. I jazzed up the background with the Baroque Motif swirl, also in Thyme. Next I stamped the little flowers with gold ink. They didn't pop enough, so I embossed them with gold. The greeting was stamped in thyme, then framed with gold paper. It still needed something, so I stamped a few more flowers on white with gold and cut them out, and attached them with dimensionals. To bring it that one step up, I adhered cream coloured half pearls to the gold flowers. I stamped a matching envelope, and there it was, one wedding card that I totally hadn't felt like making, but ended up completely loving. On a completely different note, my mom and I had sneak peak passes to The Jane Austin Book Club. I really had no expectations for the movie, as I didn't know what it was about. It was actually quite good. It's more of a "chick flick", while still being pretty guy-friendly. So I really don't like to knock something until I've tried it. The university art sale is this month, so I went and got a few Copic markers to compare against the "no-name" ones I had bought the other week. (25% off all art supplies, bringing these markers to $5.96, the average US equivalent price)First of all, like many others have said with these markers, if you don't know the basics of shading and colouring, these aren't a miracle worker. You need to have that basis before expecting superb results. My general observation with these- they are a bit excessive for card marking, but they are quite nice to draw and colour with. So here are the first few items I did. 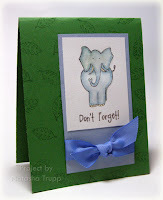 This first one is an elephant by Doodle Factory. I actually mixed my no-name markers with the copics here. Guess what. They blend together just fine! 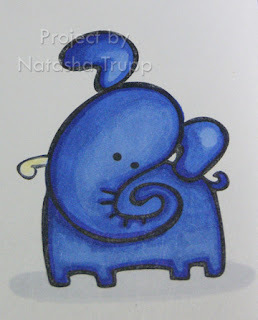 I also used Prismacolor pencil crayons (for the tusk) and the Prismacolor 10% grey marker for the oval shadow. The one big thing I noticed with the Copics right away is that they are a bit more forgiving than my no-name ones. If I don't like my colour placement, I can almost pull some away and swirl it and blend it with the next shade down. I did find, and this is to be expected, that they bleed and spread a bit more than I'd like. It's not a big deal, just means you require a lighter touch at the edges of the image. 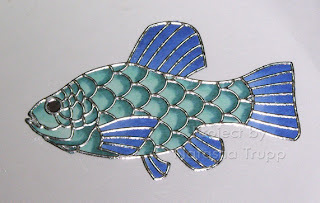 Or, you could emboss the image or use one of these Magenta peel-off stickers, like this funky fish. This one is mostly Copics (the eye is the black no-name). Another thing I noticed by this time, is that the lighter coloured markers make more of an impact. You can use them to build up dimension easier and I had an easier time mixing them with the darker colours. It's like they activated the darker colours better, which made blending a dream! Like I said at the beginning of my entry, is that I LOVED these for drawing with. Talk about inspiration to get back into drawing! I really like drawing eyes, and although these are definitely not the best ones I've drawn, I figured I'd share them anyway. I wanted to see if the Copics could achieve that twinkling light that only eyes seem to have. I was pretty pleased with the results. Again, these are mixed media/brand images. The eyes themselves were drawn with the no name markers, the irises with the copics, the highlights with white prismacolor pencil crayon and prismacolor grey marker. The flower on the right was done only with the no name markers. I figured I'd just show a side by side comparison of doodles with each. And finally, I have one more doodle. I just really liked how it turned out. It's a little cherry. I was very pleased with how well the red and the olive blended together. Color theory says they should,(use complimentary colours to darken each other- use green to get a shadowed red, etc) but that doesn't mean the product works nicely that way. 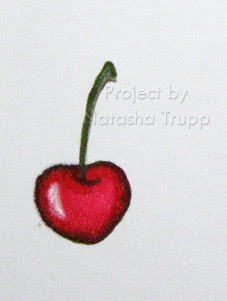 I drew the cherry in olive, then coloured in with the crimson, again, pulling the color a bit to blend the two on the edge. I left a bit uncoloured for a highlight, then emphasized it with white pencil crayon. So, there you have it, another stamper/artist's experience with the Copics. My overall opinion and observations: They are definitely high quality. I could notice a difference between them and the no names. However, if you have more experience, I'm sure you could make any medium work for you! I had more fun drawing with them, than colouring in with them. For card purposes, they seem over the top, but if you haven't yet invested in a marker set, they are similar in price to the Stampin' Up markers, and you can get decent colour matches. $187.95CDN plus shipping and taxes (in MB, as a demo that's $194,72) for 48 from Stampin' Up! versus $115US for 36 plus shipping, customs fee and local taxes (in MB, you're looking at an additional $27) so $142 for 36. You're looking at 4.05 per Stampin' Up marker, and 3.94 per Copic from My Favorite Things (the cheapest I've seen sets of Copics online). 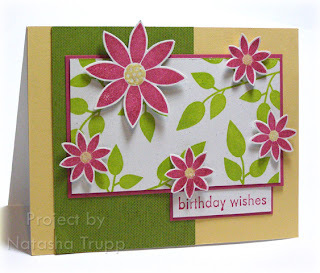 I had a request for a birthday card, something floral, for a customer's mother. This is what I decided on. I was going to do something with petal prints, but it just wasn't coming together. So instead, I tried this set- Oh So Lovely. I went with darker, richer earth tones. I didn't want something super perky. I wanted it to be a bit more elegant. The greeting is from the Card Greetings set. Like I said, I've been keeping it on my desk so I remember to use it. The flowers were coloured in with Prismacolor pencil crayons. I was in the mood for something really clean and simple. I found this cute Scenic Route paper in my paper stash the other day, so I thought I'd actually use it. I went through my textured paper collection and found a nice match. I stamped the Green Grass Stamps greeting. I thought about leaving it just like that, but I couldn't. I went back to the paper and cut out a few of the flowers and attached them with pop dots. Other than the cutting out, this would be a 5 minute card. It still only took me about 10 minutes. If you wanted to speed up the process, you could just punch out the flowers with various circle punches. I was looking through my gellies and the Superstar set practically jumped off the shelf at me... I grabbed some Colorbox inks next, and went from there. I really, really want a stamp that says SUPERSTAR! 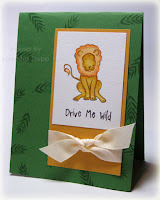 Until that day, I find substitutes, like this fun greeting from Green Grass Stamps. I keep forgetting I have this set, but it's really got some amazing greetings in it. I think I will keep it out this week on my work table, just so I make use of it some more. There's really nothing too fancy on here, just me playing. One thing, and it's likely not too visible, is that I made my own shimmery white cardstock. My supply of travel sized hairsprays was replenished today. These are perfect for making glimmer mist. I mixed some Micro Pearl Ex into one bottle- instant glamour! I had to spray at quite a difference, because too close causes ink smudging. It's not horrible, but I notice it, so best avoid it, right?